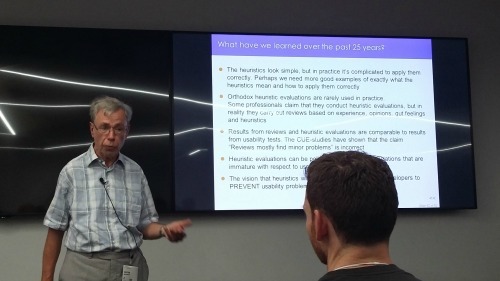 This month UXPA was at the Moo offices and had Rolf Molich speaking to us. He worked with Jakob Nielsen to come up with the heuristic evaluation criteria which are used to evaluate websites for usability. He spoke on two subjects. Firstly he spoke about CUE, or Comparative Usability Evaluation, and then after a short break about the risks of usability testing. He is a big believer in data and in audience participation and so he had multiple choice questions throughout his talks which we could complete using our smart phones and the Shakespeak website. He explained the difference between heuristic evaluation, which must only follow agreed heuristic criteria; an expert review, which can cover anything including the heuristic criteria; and usability tests, which involve a user completing set tasks on a website. With all these things the key is to discuss the results after each review or test with the other inspectors or testers to come up with consensus over what the issues are with the website. Only the agreed issues should be reported back. He also believes there is one criteria missing : suitability for the task. "Saying 'it works great' is a valid response." After a short break Rolf returned to speak about the risks of usability tests. Here he presented a selection of scenarios with possible answers of, No that's rubbish, Agree and disagree, and YES that's happened to me!, for us to vote on. He then asked us what we could do to improve each scenario, before giving us some suggestions. For instance if you have an indifferent stakeholder how do you get them to engage in the testing? He suggested trying to make it relevant to them and including them in the planning. His advice about not finding problems (although unlikely) was interesting too, saying 'it works great' is a valid response. It was a thoroughly interesting evening and Rolf gave great advice in a very engaging manner, I could have listened to the discussion for much longer.